Germans have such a complicated relationship with their history. They understand well the atrocities of WWII and the kind of thinking that led to it, but, at the same time, they were the bad guys in that fight and they know it. Beyond the inescapable evil of the top officials and “just doing my job” excuses of military brass, how does the Average Joe reconcile his part in the war? Over the years, both the GDR and the FRG made films that tackled this question. 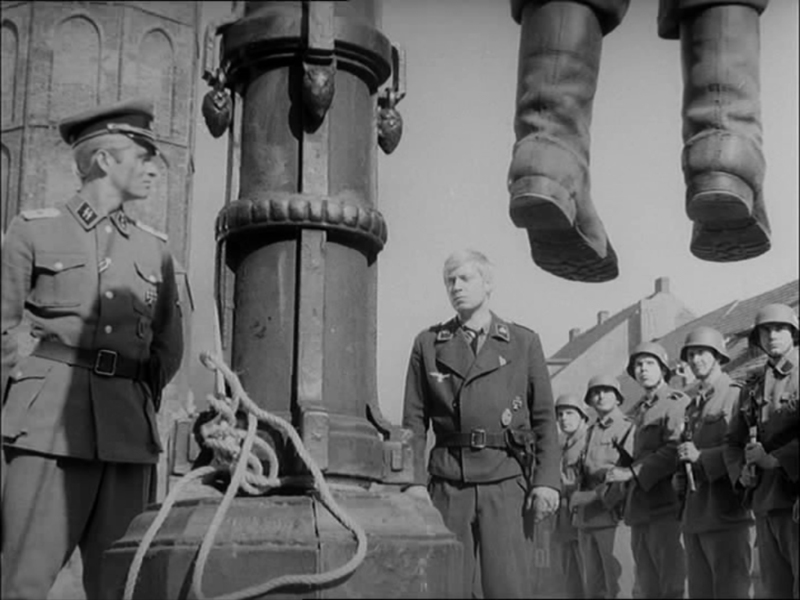 In West Germany, films like The Bridge (Die Brücke), Stalingrad (Hunde, wollt ihr ewig leben), and Das Boot examined the issue from a strongly anti-war perspective. East Germany took it further, with films such as Stars, The Gleiwitz Case, and I Was Nineteen, looking at the war from nearly every angle. The Adventures of Werner Holt (Die Abenteuer des Werner Holt), like Wolfgang Staudte’s Rotation, and Bernhard Wicki’s The Bridge, examines the war from the perspective of young people who are ignorant of the facts, filled with patriotic enthusiasm, and ready to fight. The film is based on book one of a two part series by Dieter Noll. The book was required reading in East German schools and remains well-respected in unified Germany. Both the film and the book follow the exploits of the title character and his best friends as they go from enthusiastic army recruits, ready to fight for das Vaterland, to disillusioned soldiers, aware that they are fighting for the wrong side. The story primarily centers around Werner Holt and his buddy, Gilbert Wolzow. Wolzow is a big lummox who comes from a military family and is anxious to prove himself in combat. He is intensely nationalistic and ready to die for Germany. Holt, on the other, hand is a thoughtful and rebellious young man, already prone to challenging authority in school. These two have little in common. It is only through an incident involving a smashed aquarium that they become friends at all, so it’s only a matter of time before the two part ways. The film follows the duo as they go from school to basic training to the Eastern Front. Joining them on this journey are other schoolmates including Holt’s thoughtful friend Sepp, who acts as the voice of reason in the film, and the frail and sensitive Peter, a talented pianist who is initially rejected from the army but later drafted as the Nazis started throwing everybody they could find into the fight towards the end of the war. In the book, it’s the Americans that Holt is fighting against, and it is the Americans that eventually capture him. The movie shifts the story to the east, with the Russians as the opposing force. Holt’s capture is not shown, nor is it addressed, but it matters little; the story is complete and the film stands on its own as a masterpiece in DEFA’s catalog. The most startling difference between the book and the film is in its structure. The book maintains a fairly linear timeline. We follow Holt from his student days to his eventual desertion and capture. Kunert felt that this wasn’t really working in the film, and chose instead to give his movie a nonlinear structure, relying on flashbacks to tell the story (for more about Joachim Kunert, see The Second Track). The book’s author, Dieter Noll, was one of the best and most respected writers in East Germany. He was a strong adherent to the ideals of East Germany’s brand of communism. He joined the Communist Party of Germany after the war and was a member of the SED and the East German Writers’ Guild (Schriftstellerverband), for which he served as acting chairman for several years. In 1979, a group of writers confronted the East German authorities after the expatriation of Wolf Biermann. In a moment of supreme irony, Noll denounced them publicly and helped get nine of them expelled from the Writers’ Guild. Noll ended up looking more like the rabidly authoritarian Wolzow, than the protagonist of his novels. In 1984, his son followed Werner Holt’s example and refused to fight for the GDR, immigrating, instead, to West Berlin, and eventually becoming a citizen of Israel, where he lives to this day. As mentioned elsewhere on this blog, the auteur theory falls to pieces when it comes to East German movies. The idea of one mighty leader, controlling every aspect of a film is useless here (I think it’s useless when it comes to Hollywood films too, but that’s another story for another time). Everyone who worked on a film for DEFA had some say in their areas of expertise. On this film that was certainly true, and no one more than Rolf Sohre, the film’s cinematographer. Sohre and Kunert first collaborated on The Second Track, one the most visually striking movies DEFA ever produced. Werner Holt was their second film together and the results are no less spectacular, although markedly different. While The Second Track was all chiaroscuro and rich black night photography, this film is brighter, with much of the drama taking place in broad daylight. Sohre, nonetheless, is given moments to shine. 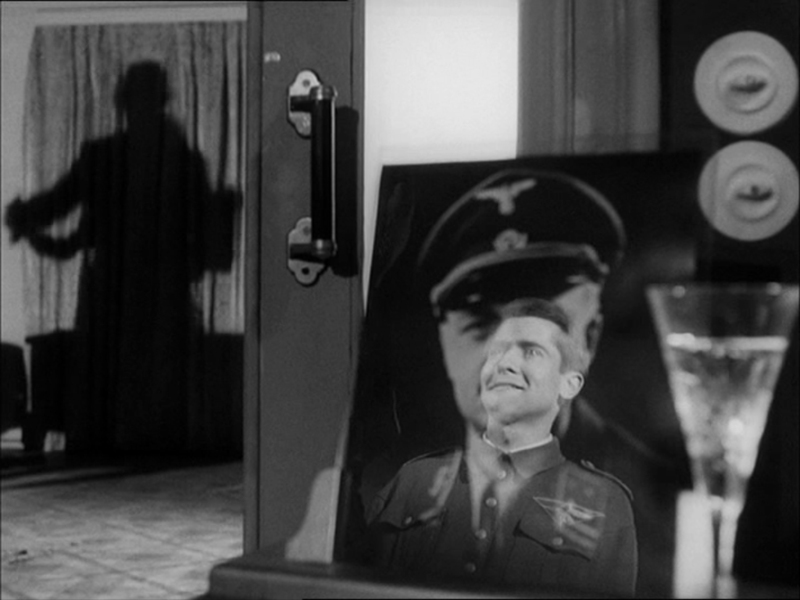 In one scene, the camera focuses on a framed photograph sitting on a table, the focus shifts and we see Werner Holt’s face juxtaposed over the frame. In another scene, the camera spins around two dancers while the other dancers appear only as shadows on the wall. For that sequence, a rotating platform was constructed, with cut-outs used as stand-ins for the other dancers. Production Managers and Art Directors are seldom given their due in film criticism. Writers might point out their contributions to set design, but rarely more than that. Gerhard Helwig’s input on Werner Holt was invaluable. Helwig made of habit of sketching his out ideas for a production in storyboard form. It was these same sketches that Kunert and Sohre used to construct many of the best shots in the film. The sequence of the jump cuts with the anti-aircraft guns, for example, was sketched out in exactly this fashion in Helwig’s notebook. Perhaps, if his sketchbooks still exist, it would be worth going back over the films he worked on and seeing how often his sketches were used to compose scenes. He may emerge as the secret director of many DEFA films. The editor was an attractive young woman named Christa Schnitt, who ended up marrying Gerhard Helwig. As Christa Helwig, she went on to a productive career at DEFA, editing many popular East German films, such as Lot’s Wife (Lots Weiß), Apaches, and In the Dust of the Stars. For almost everyone working behind the camera on this film, the Wende spelled the end of their careers, Kunert, Sohre, the Helwigs, et al, found it difficult to find work in unified Germany. For the actors, it was another story, Klaus-Peter Thiele, who played Werner Holt, had a long and successful career after wall fell. He worked primarily in television, both before and after the Wende, appearing the popular East German TV mini-series about WWII, Archiv des Todes (Archives of Death), and its sequel, Front Ohne Gnade (Merciless Front), and in popular post-wall German shows such as Unser Lehrer Doktor Specht (Our Teacher, Doctor Specht) and Hallo Robbie. He died October 2011. Likewise, Arno Wyzniewski, who played the conscious-stricken Sepp, continued working—also mostly in television—right up until his death in 1997. He was last seen in the daffy Canadian/German science fiction series, Lexx. Manfred Karge, who played the dim-witted and authoritarian Wolzow, was primarily a theater actor. He made a few films, but his first love was always the stage. He got his start at the Berliner Ensemble, where he was discovered by Bertolt Brecht’s wife and muse, Helene Weigel. In 1993 he became a director at the Ernst Busch Academy of Dramatic Arts. More recently, he returned to the Berliner Ensemble. Today he is best known in the west as a playwright. His plays include Mauer Stücke, Lieber Niembsch, and Jacke wie Hose, which was translated into English as Man to Man and performed by Tilda Swinton. Karge’s The Conquest of the South Pole (Die Eroberung des Südpols) was also translated into English and first staged in Scotland before the wall fell starring a young Alan Cummings. Earlier this year it was staged at the Arcola Theatre in London. Upon its release The Adventures of Werner Holt was a huge hit. In spite of its long running time (almost three hours) the film packed theaters. It sold over three million tickets in East Germany alone and was also popular in West Germany in spite of its East German origin. It remains one of the most respected films from the GDR.